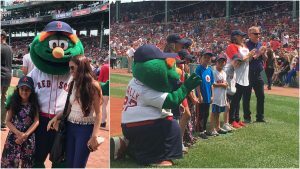 Boston Public Library and its young readers celebrated summer at Fenway Park on Sunday when the Red Sox played the Tampa Bay Rays, with the conclusion of the 23nd annual Read Your Way to Fenway reading contest. Boston’s Youth aged 5-17 were encouraged to read a minimum of three books for a chance to watch the Red Sox play. More than 503 youth participated in the program and 438 winners were chosen, as well as a few lucky on-field pregame participants. Read a few sample winning essays here. “Read Your Way to Fenway is a much-loved, fun initiative that fosters the reading and literacy skills of our young people over the summer months, and Boston Public Library is grateful to the Red Sox Foundation and Aramark for their support helping these readers celebrate their accomplishments with family, friends, and their first place team,” said David Leonard, Boston Public Library President. Summer reading events continue through August for people of all ages, with children celebrating the theme “Libraries Rock!” and teens learning how to Cook with Miss Debbie and Breakdance with the Floor Lords. Adults may fill in a Bingo card, available at all BPL locations, or download and print the card with what you read, did, or discovered through Friday, September 7. Boston Public Library and its patrons have currently read 1.9 million minutes so far this summer, surpassing its citywide goal of inviting Bostonians of all ages to read a collective one million minutes from June through August. The BPL encourages readers to continue submitting minutes through August to see how far it can go. Read Your Way to Fenway is generously sponsored by the Red Sox Foundation and Aramark.